2. In a large mixing bowl, whisk together the heavy cream, Dijon, and garlic; add salt and pepper. Cut the potatoes as thin as possible using either a mandoline or your sharpest knife and place them in the cream mixture to marinate. 3. 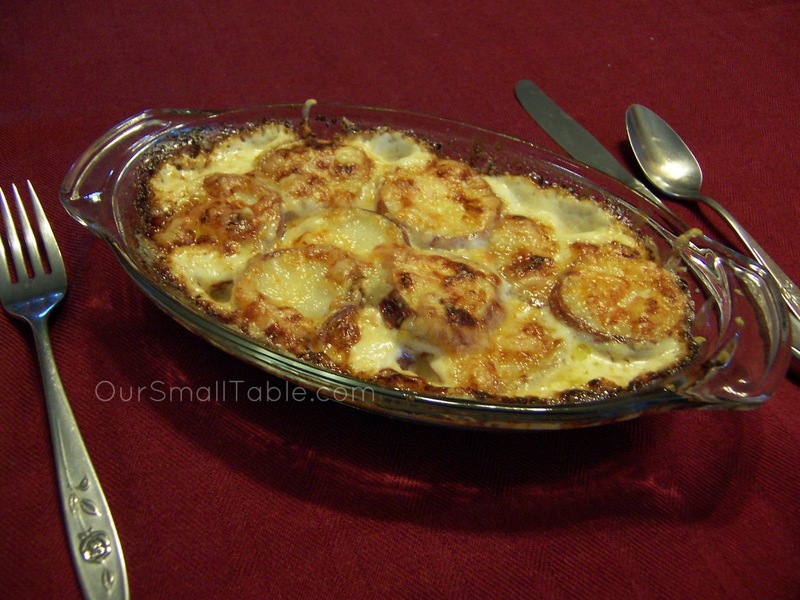 Rub the olive oil all over the sides and bottom of two gratin pans and then begin shingling the potato slices in a single layer on the bottom of the pans. When the first layer is finished, sprinkle a thin layer of both Fontina and Gruyere on top of the potatoes (it should be about 1 Tbsp of each, depending on the shape of your pan). Repeat this process until you have 3 layers of potatoes, then pour the cream mixture over the top, filling it up about halfway; make sure you reserve enough of the Gruyere to liberally coat the top layer of potatoes. 4. Bake, uncovered, at 400°F for 30 minutes, then turn on broiler and broil for 2 more minutes. Let cool for at least 5 minutes before serving. Robyn's notes: this is another recipe I'm quite proud of. It came out fabulously. When the first 30 minutes of cook time had finished, I took the pan out of the oven, turned on the broiler, and poked through all three layers of potatoes with a toothpick, to see how tender they were. If any part of them had been still crunchy, I would have broiled for longer than the 2 minutes, to get them nice and tender. Fortunately all three layers were perfect, so the 2 minutes under the broiler was just right to give it an extra browning on top. Since I'm not allowed to eat potato skins, I peeled my half of the potatoes. I served this as a meal, but it can also be a side, though I'd recommend getting all the smallest potatoes possible if serving as a side.